Home / PILL HEADS / PILL HEAD JIG UNPAINTED – 1/4 – 3/8 – 1/2oz. 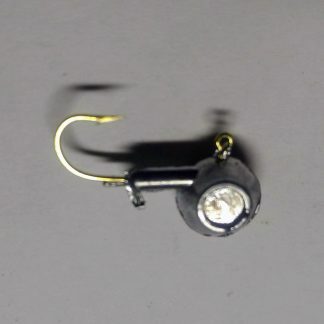 PILL HEAD JIG UNPAINTED – 1/4 – 3/8 – 1/2oz. The flat sides of the jig permit placement of stick-on decal lure eyes on the jig head. Size 2.5 Stick-On Lure Eyes fit all weights of Aspirin-Head Jigs: Size 4 eyes can be used on 3/16 oz. and above; Size 5 eyes will fit on 1/2 oz. Available in barbed collar only. Weight Choose an option1/4 oz.3/8 oz.1/2oz. 1/4 oz., 3/8 oz., 1/2oz. 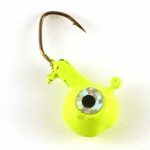 BIG HEAD JIG UNPAINTED – 1/4 oz. Rare big head or ledge jig specially designed for small hooks and to minimize hang ups while fishing deep ledges and brush piles. PILL HEAD JIG PAINTED – 1/4 – 3/8 – 1/2oz. BIG HEAD JIG PAINTED – 1/4 oz. This hard to find big head or ledge jig is for fishing deep and specially designed for smaller hooks to minimize hang ups. Has a recessed eye ideal for stick on eyes. PILL HEAD JIG UNPAINTED 1/24 - 1/16 - 1/8oz. PILL HEAD JIG UNPAINTED - 3/16 oz.